For the last few months I’ve been trying something new to visually organize my priorities. 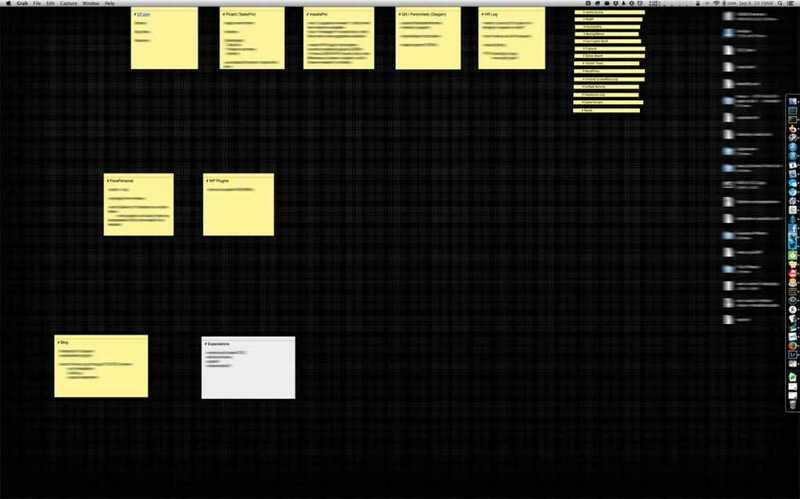 I’m using the built-in OS X Stickies app as a visual organizer. I have a separate desktop that I use just as a Stickies board. It’s easy for me to switch over to it as needed when I want a bird’s eye view of everything I have going on. The way I organize the Stickies makes sense to me – you’ll likely have your own method. When you have lots of projects, it can be hard to prioritize all of the things you need to do. I’ve created a sticky for each project where I jot notes for the next few things I want to work on, and move them around into current priority order. This allows me to focus on my top priority with visual reassurance that other things aren’t forgotten, they just aren’t being worked on right now. Thought about using Stickies instead of my Todo.txt, but how could I synchronise them across computers? I gave up on multiple machines a few years ago. Have you tried Trello.com? It allows you to create boards similar to what you’re doing to keep organize and collaborate. It’s free to sign up. You can invite others in your team to join the board and collaborate. It’s a cloud service so everything is saved and accessible from anywhere.